Derek Jeter: Can the Yankees Survive in the AL East Without the Captain? Over the weekend the Yankees answered this question with a resounding, unequivocal, yes. Although Jeter will surely be a first ballot Hall of Fame shortstop, he is no longer a crucial piece of the Yankee puzzle. Although it is impossible to measure the effect of losing a big name like Jeter on a team’s psyche, the Yankees seem to have been unaffected by Jeter’s absence. Since the captain was placed on the DL last Tuesday, the Yanks have won six of their last seven games, bringing their recent total to nine wins in their last eleven contests. Before leaving for the disabled list, Jeter was batting only .260 with 20 RBI in the lead-off spot. Seven players in the Yankees starting lineup have had better OBP than Jeter this season (Martin, Teixeira, Cano, Rodriguez, Gardner, Granderson, Swisher). If anything, the Yankees are going to have to make a tough decision when Jeter comes back about whether he is the best option for the leadoff spot for the Yankees. Yankee Manager Joe Girardi has experimented with both Nick Swisher and Brett Gardner in that role since Jeter’s injury. It seems obvious at this point that the Yankees would benefit from moving Jeter down in the lineup. But if Jeter isn’t batting first for the Yankees, where does he fit? It seems unlikely that Girardi would move Granderson, who is having an MVP caliber season in the two-spot, and he certainly would not move either Teixeira, Rodriguez or Cano at the three, four and five-spots. If Posada took himself out of the lineup for being batted ninth, Yankee fans have to wonder how a very proud Derek Jeter might react if he’s asked to bat sixth when coming back from his injury. Normally, speculating about the MVP before Father’s Day would be premature. This year is the exception. With 95 games still to go, it seems almost certain that the American League MVP will come from the AL East. Red Sox first baseman Adrian Gonzalez, Blue Jays third baseman/outfielder Jose Bautista and Yankees centerfielder Curtis Granderson have separated themselves from the pack, while reigning champion Josh Hamilton has likely been removed from contention due to a broken arm that kept him out of the Rangers lineup for more than a month. Offensively, the MVP hunt has turned into a three horse race. Here’s six reasons why Yanks outfielder Curtis Granderson is going to come away with it. What jumps out first about Granderson’s season is his power numbers. Already this season, Granderson has clubbed 21 home runs, matching Jose Bautista and teammate Mark Teixeira’s league-leading mark (while also leading Adrian Gonzalez by 7). For Granderson, who has averaged 27 HR per 162 games, this pace is unprecedented. But it may not be an anomaly. Players typically tend to hit better in their second year with a new club and as a left-handed hitter Granderson has greatly benefited from the short porch in right field at Yankee Stadium. At this rate, he’ll hit 52 home runs this year. While that number may be high, anything over 40 home runs would be MVP caliber production from a player with Granderson’s speed and defensive value. Also, Granderson has 52 RBI this season while batting in the two spot. He’s leading Bautisita, a cleanup hitter, by 10 RBI. True, he’s trailing Gonzalez, but Gonzalez is also the third hitter in the Red Sox lineup and he’s hitting behind Jacoby Ellsbury and former AL MVP Dustin Pedroia, who have both been on base more this year than the struggling Derek Jeter, who’s hit only .260 in the leadoff spot for the Yankees this year. Tack on the fact that Granderson is third in the league in slugging percentage (.608), and his power numbers are the most impressive in the American League. Baseball fans can entertain arguments about who the best hitter is in the American League, but as far as speed goes, Granderson makes Bautista and Gonzalez look like Wiley Coyote. They’re just never going to catch him. He leads the American League in Power-Speed, a statistic created by sabermetrics guru Bill James. The statistic measures “the harmonic mean of home runs and stolen bases,” and Granderson’s metric reads at 13.5, which is 2.7 points better than anyone else in baseball today. He’s off the charts. Already this season, Granderson has stolen 10 bases and scored 58 runs (tops in the American League). He has double as many stolen bases as Bautista, while Gonzalez only has one this season. Bautista’s success rate is also lower than Granderson’s impressive 71% on stolen base attempts. Granderson’s stolen base total is also hindered by the scarcity of opportunities he’s given himself to steal. He’s already hit five triples this year. When the ball gets to the outfield, he can get to third all by himself. Simply put, when Granderson gets on base, he scores. Granderson’s range in centerfield has made him one of the Yankees most valuable players this year. He chases down balls that other centerfielders don’t get to. He’s currently ranked the fourth best centerfielder in the American League and Wednesday night’s game against the Texas Rangers was evidence of why. Not only can Granderson chase down balls to the gap, he also has the ability to throw runners out, which Yorvit Torrealba learned the hard way on Wednesday. Granderson’s rocket to home plate was his league leading fourth assist of the season from center field. We’ve already mentioned that Granderson’s power numbers have exceeded expectations, but the short porch in Yankee Stadium has clearly been his friend and that won’t change in the coming months. His other numbers are more on target with his career averages. At .278, Granderson is batting only 8 points above his career average and there is no reason to think that he could not maintain this pace. Meanwhile, Adrian Gonzalez has caught fire. Leading the American League with a .343 average, he’s currently hitting 54 points higher than his career average and 45 points better than his total last season. He’s hitting .413 in the month of June. It’s very rare that a player’s batting average jumps 50 points in a year, and especially in the first season with a new team. If Gonzalez can keep his red-hot hitting up, he will make the decision for MVP very difficult. But the odds dictate that he will eventually slow down, and when he does, his power numbers will not compete with Granderson’s. Since the Designated Hitter was instituted in the American League in 1973, no DH has ever won MVP honors. For anyone jumping on the David Ortiz bandwagon (.317 BA, 17 HR, 43 RBI), get off. It’s simply not going to happen. For all the gamblers out there, Granderson is the third ranked baseball player in fantasy this year. With millions of people using Yahoo! Sports, ESPN and CBS Sports for fantasy baseball, that has to count for something. Right? Once again LeBron walks away from the NBA Finals stage with a bitter taste in his mouth once again. I start to wonder if the superstar will ever get the job done. The bottom line is you have to win your home games. The Heat just did not do that. You can look past their first loss at home since they got that game back as soon as they shipped out to Dallas but their performance in Game 6 was miserable. The team that clearly wanted it more won. Congratulations to Jason Kidd, you deserve this. Congratulations to Dirk Nowitzki, you certainly deserve this as well. Jason Terry, you may now breathe a sigh of relief as you have validated your ridiculous tattoo. 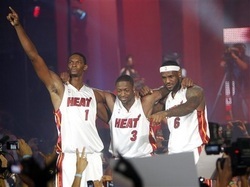 LeBron James, Dwayne Wade, shame on you. This was your finals to lose and you lost it. In my opinion the game can be summed up in one simple stat, 20-33 from the free throw line. The Heat were successful in getting to the line and shot 15 more free throws than the Mavs did. The Heat had Tyson Chandler and DIrk Nowitzki in early foul trouble. The Heat never capitalized. They had one brief shining moment near the end of the first half when they were down 12 and rallied a 14-0 run to close the gap ending the half only down 2 points. Everyone had to be thinking, here comes the Heat. But no, Dirk decided it was time to stop messing around, it was the finals after all. Maybe the Heat never got that memo. Maybe they didn't realize this was an elimination game for them. Maybe they were too busy mocking Dirk and talking about how many rings the bunch of them would collect together. Well right now that total is 0, and they have no one to blame but themselves. Less than a year ago, Jorge Posada was the New York Yankees four-time World Series Champion catcher whose skills were so respected and whose leadership was so revered that he was included in the ranks of former Yankee catchers Thurman Munson and Hall of Famers Yogi Berra and Bill Dickey. During the off-season it was announced that the 39-year old Posada would be relegated to the position of DH. Posada was not happy, but he accepted his role. Early in the season, Posada struggled mightily, and especially against left-handed pitching. Yankees Manager Joe Girardi restricted the switch-hitting Posada to batting against right-handed pitching and dropped him in the order. Posada was not happy, and this time he sat himself down. After an unceremonious move that many criticized as childish, Posada found himself under attack from the fan base he spent the previous 16 seasons endearing himself to. Batting only .165 and 0-24 against left-handed pitching on May 13, Posada’s plummet from grace seemed to have come to its conclusion. Since then, Posada’s average has risen to .195, but his day-to-day value as an only-against-right-handers DH has kept his roster spot with the Yankees in jeopardy. Then, last night, a wild split-finger fastball from left-hander Jon Lester may have changed all that. As had become the norm, Posada was scratched from the lineup against left-handed starting pitching, making him the most expensive spectator in the ballpark. But after Mark Texeira was hit on the knee-cap by a wild pitch from Lester, Posada was called in to pinch hit. Posada rose to the occasion last night, recording his first three-hit game of the season, including two hits off of left-handed pitching. Just like that, Jorge’s average against left-handed pitching jumped from .000 to .069. Still pretty abysmal, but he had so few ABs against lefties this year that his average jumped nearly 35 points per hit. So Joe Girardi’s binder says that Posada should sit, but why? 29 ABs amounts to about a week of baseball. Posada is a career .283 hitter against left-handed pitching. Couldn’t hit poor numbers be accredited to a terrible slump? A week’s worth of bad hitting? To find out, I performed several T-tests to test the statistical significance of Posada’s depreciated statistics with using a confidence interval of 90%. Currently, I found that Posada’s average against left-handed pitching this year is significantly worse than last season or his five-year average. However, because the sample-size of 29 ABs is so small, the statistics are still highly malleable. Also, because Posada hasn’t been allowed to hit against left-handed pitching for nearly a month, his statistics from the left-hand side of the plate have not seen the benefit of improved hitting of late. So consider this: suppose for a moment that Joe Girardi had some renewed confidence in Posada and decided to let him hit against left-handed batting again. If he were to hit 7/28 or .250 in his next 28 ABs, his average would rise to .157 against left-handed pitching. These estimates assume that Posada has broken out of his slump, but will still hit worse than his career averages or his previous season at the left hand side of the plate. These conservative estimates would allow Posada to more than double his batting average in less than a month. Last season, Posada had 136 ABs against lefties and hit .257. Despite an extremely rocky start, with a stretch of .250 hitting for 28 ABs, the difference in Posada’s average from the left-hand side of the plate would not be statistically significant from last year. Of course, implicit in this article is the assumption that Jorge Posada is capable of better. But with only 27 ABs from the left-hand side of the plate in the midst of a horrible slump, it seems nonsensical that Girardi would prohibit a five-time all-star from more than a third of his ABs in favor of Andruw Jones (.215 BA) or Eduardo Nunez (.212 BA), who were batting eighth and ninth in the order last night, respectively. He’s being paid $13.1 million and history would suggest that he’s capable of more. If Posada is still hitting under .200 by July, by all means, the Yankees should cut him. But limiting his ABs is just going to make it harder for him to get out of this slump. As bad as its been, Girardi and Yankee fans need to remember that, statistically, Posada could turn this all around in a couple of weeks, if given the chance. With more than 100 games still to go in the season, Yankees fans need only to look at tonight’s starting pitching match-up to recognize their team’s biggest weakness. While the rival Boston Red Sox are sending Jon Lester to the hill, the Yankees will counter with Freddy Garcia. Although one of the keys to the Yankees success this season has come in the form of pleasant surprises from Freddy Garcia and Bartolo Colon, they cannot be relied on for the same kind of production for the rest of the season. At 4-4, Garcia has already pitched well above his pay-grade, while Colon has been dazzling considering he wasn’t even in baseball last season. That said, everything they have given the Yankees thus far must be considered a bonus, and Yankees General Manager Brian Cashman will be looking for a starting pitcher to add before the trade deadline. For that reason, the future is uncertain for Russell Martin, Nick Swisher, Brett Gardner and Joba Chamberlain, all potential trade pieces as the Yankees inch closer to the July 31 deadline. Unfortunately for the Yankees, there is a scarcity of starting pitching available this year and so Cashman will likely have to buy at a premium. In addition, of the Yankees who Cashman could realistically trade, only Martin has had a year which has inflated his trade value. If the Yankees are not willing to part with him, they will likely have to dip into their farm system to get a quality arm in return. Cashman, who has only traded one blue-chip prospect in the last five years (Austin Jackson), will be reluctant to shake up the minor leagues too much this year in pursuit of a starting pitcher. So with that said, here’s a look at five guys the Yanks definitely will not get rid of in the coming weeks. 1. Pitcher DJ MitchellWith uncertainty plaguing the Yankee starting rotation, Cashman is going to be reluctant to give up his most promising minor league arms. Mitchell played his college ball at Clemson University and was drafted in the 10th round of the 2008 draft by the Yankees. At 6-0 ft and only 160 lbs, Mitchell size isn't nearly as formidable as his stuff. His primary pitch is a sinker, but he also throws a good curveball which gives him good strikeout numbers for a sinker-ball pitcher. For the last three seasons, Mitchell has bounced around the Yankees minor league system, enjoying sporadic success with all three teams. This year, however, he seems to have finally settled into a confident role as a starting pitcher with Triple A Scranton. He has gone deep into ball games, averaging nearly six innings per start, while maintaining an impressive 2.95 ERA. In 61 innings of work, Mitchell has also struck out 42 batters. Like any sinker-ball pitcher, his WHIP (1.24) is higher than you might expect when compared to his ERA, but what's really important is that he's keeping the ball in the ball park and he's only allowed three homers this season. With guys who throw a good sinker, there's always seeing-eye-singles that sneak through the infield on the ground, but Mitchell isn't getting drilled. He's only 24-years old, so he won't be called up this season (or maybe even next), but this is a name to remember and one that Cashman will be extremely reluctant to part with.2. Catcher Gary SanchezThis one may come as a surprise to Yankee fans who know that Sanchez was sent to Extended Spring Training this week because of "attitude problems." Apparently, Sanchez pulled a Posada and refused to enter a game off of the bench or catch a bullpen session due to his frustration with his own poor play. Fortunately for Sanchez, his penance may turn out to be lighter than Posada's, who is likely to be cut in July if he doesn't hit a solid streak. As discouraging as the news from Scranton was this week, it's no reason to give up on the 18-year old Sanchez. Signed for $3 million as a 16-year old international free agent by the Yankees in July 2009, he is one of the most promising young talents in the Yankees farm system. In 2011 he was ranked the 32nd best prospect in baseball by MLB.com. Big money and high praise like that can go to an 18-year old's head pretty quickly, especially for a guy coming from humble origins in the Dominican. New of his rebelliousness is not good, but it's not entirely surprising either. Growing pains hurt sometimes. More importantly, this kid tore it up last year in rookie ball and with the Staten Island Yankees. In 136 PAs in the rookie Gulf league, Sanchez smoked the ball, hitting .353 and boasting a .419 OBP before being called up to Staten Island. In an additional 54 ABs with Staten Island last year, Sanchez continued to produce, hitting .278 with a .333 OBP, all as a 17-year old. He's having some struggles this year, but remember, this kid still has three more years before he's legally allowed to buy a beer and he's already a millionaire. He's got unbelievable talent and the Yankees would be foolish to move him before they know exactly what they're dealing with. 3. Pitcher Manny BanuelosOne of two exciting pitchers in Double A Trenton, Manny Banuelos is among the Yankees most prized possessions right now and he may not be as far away from the majors as many thought at the beginning of this season. At 20-years old, the Mexican native is still extremely young, but his talent has wowed scouts since playing his first game in the Yanks rookie league in 2007. Watching Banuelos is strangely reminiscent of Pedro Martinez. At 5'11", 155 lbs, Banuelos is not a big guy, but the power he gets behind his fastball defies logic. He reaches 93 mph on the gun regularly and throws a nasty change-up which keeps hitters' timing off. Only difference is, Banuelos is a lefty. In 11 starts in Trenton this year, Banuelos is yet to record a loss and his ERA is an impressive 2.84. The biggest knock on Banuelos is his control. He's already surrendered 29 walks in 50.2 innings. Even so, the 41st ranked prospect by Baseball America is receiving more an more media attention with each start and it's only going to get harder for the Yankees to keep hiding him in the minors. Personally, I hope they leave him down there for at least another year. After all, look at what Ian Kennedy is doing for the Diamondbacks this season. 4. Pitcher Dellin BetancesBetances has been Banuelos's partner in crime at Double A Trenton this season. Earlier this week, Cashman said in a press conference that it is a possibility that Banuelos and Betances are called up to help the major league club if the Yankees are still in the midst of a pennant race in the late summer. That said, it's much more likely that Yankee fans will get a look at Betances than Banuelos this because of his age. The 23-year old Betances has been in the Yankees system since he was drafted by the Yanks in the 8th round of the 2006 draft and he's had much more minor league experience. Add that to the fact that AA Scranton may not have a whole lot more to offer to Betances and you might see him in the majors sooner than you think. He's dominated there this year, posting a 1.99 ERA while striking out 50 in just 45 innings. The Yankees will need to be careful with Betances though, because his work has been limited in the minors. Since 2006, he's only thrown 345 innings, which means that it is unlikely that he could slip into the Yankees rotation without significant risk of injury. Many teams these days now take the so-called Verducci Rule (pitchers under the age of 25 who increase their innings by more than 30 year after year have a significantly higher risk of serious arm problems) very seriously, and the Yankees would be smart to do the same. The young right-hander has already had elbow surgery so the Yankees need to handle him carefully. 5. Catcher Jesus Montero By now, Jesus Montero is a household name without ever having seen a pitch in the major leagues. He's been ranked in the Top 50 Prospects by Baseball American for three consecutive years, including a no. 3 overall ranking in 2011. Despite his accolades, there has been speculation this season that the Yankees might trade Montero in order to bring in another pitcher. Unless the Steinbrenner's overrule Cashman like they did with the Rafael Soriano deal, it's not going to happen. Montero is in New York to stay. Brian Cashman has been bragging about Montero for more than three years now, and Montero is still only 21-years old. He's played so well in Triple A Scranton this year that he was quoted telling reporters that he was "bored" earlier last month. As soon as there is space on the major league roster, he's coming up. The biggest knock on Montero is his defense and many scouts have suggested that Montero may need to switch positions to be effective in the majors. This could work perfectly for the Yankees, who would be happy to keep Russell Martin, an excellent defensive catcher and favorite of Yankee starters, behind the plate. Meanwhile, with two struggling corner outfielders, Montero could play his way into a spot in New York sooner rather than later. For Gardner and Swisher, the pressure may be on very soon. Miami Heat head coach Erik Spoelstra has the worst job in the NBA. At the young and inexperienced age of forty, he lacks court presence and fails to command the sage-like respect that other championship coaches engender from their players. Beyond that though, if the Heat win this year, Lebron James and Dwayne Wade will earn all the credit, while Spoelstra will be the footnote. If they lose, he’s likely to be fired. For that reason, I’ve defended Spoelstra all year long. He’s managed three colossal egos masterfully this year, leading a team which began the season with almost no chemistry all the way to basketball’s pinnacle. With that said though, last night’s loss against the Dallas Mavericks has to fall squarely on his shoulders. Forgetting for a moment the devastating 17-2 run with less than seven minutes to go in the game, Spoelstra’s biggest strategic error came within the final two minutes of play. After another poor offensive possession in which Lebron James waited again till the final minutes of the shot clock to throw up a low percentage, deep, three-point shot, the Mavericks grabbed the defensive rebound and had a chance to take the lead. Unbelievably, when the Mavs set up on the other end, it became apparent that Dirk Nowitzki was being guarded by Udonis Haslem, not Lebron James. If anything should have been learned from the Eastern Conference Finals this year, it is that James should be guarding his opponent’s best player for the final five minutes of play. This was the Heat’s strategy against the Bulls, and they were able to essentially neutralize NBA MVP, Derrick Rose. Recognizing this weakness, Mav’s forward Wilson Chandler set a screen on Haslem, freeing Nowitzki for a wide-open, three-point shot. And just like that, the Mavs were up three. Would a 6 foot 9, 275 lb Lebron James been able to shed that screen? Who knows. After a timeout, a defensive breakdown by the Mavericks allowed Mario Chalmers an open three-pointer from the corner to tie the game. Instead, inexplicably, when the Heat came out of the huddle, Lebron took his place at the top of the key, guarding Jason Terry. Chris Bosh was charged with the responsibility of guarding the seven-foot German. We all know what happened next: Iso. Dirk Drives. Dirk scores. Ball Game. Lebron, the Heat’s best defender, was totally uninvolved on the final two defensive possessions, despite the fact that the Mavs offensive game plan was more predictable than the sun rising the next morning. Dirk Nowitzki had 24 points last night. He did not have a dominant performance. Erik Spoelstra allowed him to steal one from the Heat at home. In a 162-game season every major league team must scramble to find enough pitching to account for a minimum 1,377 innings (and that’s only if a team wins every road game). That’s a staggering 4,131 outs. So consider this: Last year, Roy Halladay led the majors in innings pitched with 250.2. That means, if a super-team could somehow put five Roy Halladays on their staff, their bullpen would still need to manage 123.2 innings throughout the course of the season, or the equivalent of nearly 14 games. That’s why for so many teams, bullpen strength is a difference maker in the standings and the post-season. In preparation for the 2011 season, the New York Yankees thought that their bullpen may have been one of their strongest assets. Brian Cashman countered unproven starting pitching with former Tampa Bay Rays reliever Rafael Soriano, who was still waiting for the ink to dry on his blockbuster, 3-year, $35 million deal. On May 14, the Yankees confidence in their bullpen was shaken when Soriano was placed on the fifteen day disabled list with soreness in his right elbow. To make matters worse, legendary closer Mariano Rivera blew two saves in a week, bringing his blown save total to three for the season. The Yankees are now saying that Soriano may not be available until the beginning of July. Quietly, David Robertson has been the Yankees answer to this problem. In the absence of Soriano, Robertson has stepped up his game significantly, cutting his ERA from last season in half while striking out nearly two batters per inning. People around the clubhouse talk very highly of Robertson and admire his work ethic and demeanor. Rivera raves about him. The rest of the country is busy admiring his fastball. In 21.1 innings of work so far this season, Robertson has a career best 1.27 ERA. In 24 appearances he’s been dazzling when brought in to games with runners on base, surrendering only four runs so far this season. Better yet, he’s already struck out 35 batters. They say the faster the ball goes in, the faster it goes out. Not the case with Robertson. The 26-year old right-hander has yet to surrender a homer this season, and has only allowed 16 hits. And the best part for the Yankees? He’s only making $460,000 this year. It’s been a long road for Robertson, a Birmingham, Alabama native who played his college ball for Alabama. He was drafted in the seventeenth round by the Yankees in 2006 and he spent 2008 and 2009 bouncing between the majors and the minors. Last season was his first full year with the Yankees and he pitched well, posting a respectable 3.82 ERA in 61.1 innings. Maybe it took the southern boy some time to get acclimated to the big apple, but for whatever reason, Robertson has been pitching on another level this season. This all bodes well for Cashman, who has been conscientious about paying more attention to the minor leagues in recent years. His investments in the future may already be paying dividends. Robertson has been a key component of the Yankees bullpen this year, but the Yanks front office is already peering back down into their ranks watch Dellin Betances and Manny Banuelos, who are turning heads down in Double-A, Trenton. If the Yankees continue to march young talent out of the farm system, their old-age problems could quickly fade. Remember, objects in the rearview may be closer than they appear. Shaquille: O'Neal: The Best Is Yet to Come? After nineteen NBA seasons, four NBA championships, three NBA Finals MVP honors, 15 all-star seasons, and an NBA MVP award, it’s hard to believe that Shaq’s best years may still be in front of him. But after announcing his retirement on Wednesday, Shaq gave an interview to SportsCenter in which he announced his retirement press conference and talked a little bit about his future plans. Shaq called himself a “business man” and said that he will be watching over some of the small businesses he owns while he rehabilitates his body this summer. He is on the advisory board of Tout Industries, a technology company in San Francisco. But a couple of business meetings certainly are not enough to keep Shaq, the professional athlete, platinum artist, serial entrepreneur, and reality television star occupied. Nope, Shaq told ESPN that he is currently writing his dissertation and hopes to be Dr. Shaq by December of this year. He is currently pursuing a Ph.D. in Human Resources Development at Barry University in Miami. Which begs the question: what’s that? Turns out Mr. O’Neal has been busy. The Human Resources Development program is a 48 credit program which requires a dissertation. Barry is a private, Catholic institution with just under 4,000 graduate students. It is unranked by U.S. News and World Report, but the program fits shaq perfectly. The four-time champion is pursuing a doctorate which is described as a “Leadership and Education” degree. According to Barry, this degree will “prepare you to lead your organization to higher levels of quality and productivity.” Shaq can probably check those boxes already. Alright, so what does Shaq plan to do once he’s Dr. O’Neal? He says he’s going to run for sheriff, which would automatically make him the most physically imposing law enforcement officer in the United States. It’s a shame that Shaq is so interested in doing good and creating positive change in the community. I think it would be a lot better to “Sir” Charles Barkley bickering with Dr. Shaq on NBA Shootaround. That might just be better than any NBA game played next season. Coming in to the 2011 season, many questioned whether the New York Yankees would have enough starting pitching to be considered a serious contender. With nearly a third of the season in the rear-view mirror, the Yankees occupy a familiar spot at the top of the American League East, but their journey there has been foreign. Although they’ve scored an American League leading 264 runs, the Yanks have endured struggles from their usual anchors, Derek Jeter (.259 BA) and Jorge Posada (.159 BA). Mariano Rivera has also blown three saves. In addition, Alex Rodriguez (.277 BA) has struggled periodically and his average has dipped as a result. For all of the home runs the Yankees have been able to produce (80), they do not have a single starter batting .300 this season. The great surprise of the 2011 season has been that the Yankees have been saved by their perceived weakness: the back end of their rotation. Between Bartolo Colon, Freddy Garcia and Ivan Nova the Yankees have 10 wins this season and both Colon and Garcia boast 3.26 ERAs. The strange irony of the Yankees season this year, then, is that if they want to return to the playoffs, they are going to need another starting pitcher, not another bat. As good as Colon, Garcia and Nova have been, they have also been spotty at times and the Yankees are going to need at least one more reliable arm if they are going to have any success in the playoffs. With 264 runs scored, its clear that the Yankees can generate offense (even if it is only with the home run). So they need to start thinking hard about dealing some of their offensive players who are having unusually good seasons in order to get defensive value. With all that in mind, here are five players Yankee fans should keep in mind looking forward to the trade deadline. Mark Buehrle- The biggest problem the Yanks are going to face is that there just isn’t going to be a lot of great starting pitching available at the break. If the Cardinals weren’t playing so well, they might have had a shot at Chris Carpenter. No shot at that one. If the Phillies were struggling to hit, like many thought they would, they might agree to part ways with Roy Oswalt, but instead they’ve scored 225 runs. No reason to give a potential World Series opponent a number two starter. What the Yankees are likely left with are pitchers a step down from that caliber, like Mark Buehrle. Playing for a struggling White Sox team, Buehrle has had a solid season. With a 3.91 ERA, he has won four games for the Chicago Sox. No number two starter, but he’s a solid career pitcher who could give the Yanks some insurance down the stretch. Felix Hernandez- This guy could be the kind of starter that the Yankees really need. With an impressive career 3.20 ERA, Hernandez had a career best 2.27 ERA in 2010 and has already won five games in 2011 for a Mariners team that has struggled to hit. At only 25-years old, this right-hander has a ton of upside and the Yankees will really need to make a good offer to get a pitcher of this caliber. Jeremy Guthrie- If the Orioles continue to slide, this is another guy who could be on the market when the trade deadline rolls around. Like Buehrle, Guthrie is probably a step down from a Felix Hernandez type in quality, but the Yankees would be getting a very solid starting pitcher who could help maintain some stability down the stretch on a team with untested starting pitching. If the Yanks get Guthrie, they can expect to be getting a guy with an ERA typically below four who can go out and win ten games a year for them. He also is a pitcher who shows a lot of promise. With a WHIP of 1.14 this season, Guthrie may compete better in a city like New York where the run support will be there. He only walks one batter every six innings, so his control is there. And best of all, he’s pitched in the AL East since 2007, so he’s very familiar with the arch-rival Red Sox. Trade Russell Martin, Call up Jesus Montero- In 2008, Russell Martin was an all-star with the Los Angeles Dodgers. So when Brian Cashman picked him up this off-season with a one-year $4 million deal, it was a no-brainer. To say that the Yankees have gotten their money’s worth from Martin this season would be an understatement. Aside from his great defense, which has saved countless breaking-balls in the dirt for A.J. Burnett, Martin is having a career year offensively. Sporting a .363 OBP, Martin has also hit 9 HR and 26 RBI in 44 games behind the plate already this season. It might seem counterintuitive then to trade Martin, but the fact of the matter is that his trade value has never been higher and the Yankees have a budding star waiting for a shot in AAA. The third ranked prospect in the country before this season, Montero has hit well in Scranton this spring, with a .306 BA and 3 HR. Brining up Montero may be a step down from Martin for this season, but if the Yankees can use Martin’s value to bring in an arm, they have do it. They can score enough runs without Russell Martin, but to become serious contenders for a title, they need another starting pitcher. Trade Joba Chamberlain- Again, Joba has been very good for the Yankees this year, but his trade value may not have been this high in several years. The Yankees right-hander is currently making $1.4 million this year with the Bombers and his price tag will also make him easy to move to other teams. Joba currently owns a 3.12 ERA, but his WHIP is an impressive 0.962 and he’s looked very sharp so far this season. Joba has become a solid right-handed arm coming out of the bullpen, but probably not much more than that. Also, with the way David Robertson has been pitching this season, the Yankees will likely use him as a set-up man instead of Joba in the post-season. If they Yankees can move Joba and get better value, they should do it. Joakim Noah referred to the Miami Heat as a "Hollywood" team after they ended his season last night. Now either Noah is as dumb as he is ugly or he was referring to the Heat's star power. For once I will give Noah the benefit of the doubt and assume he was making a semi-intelligent comparison of characteristics and is not completely ignorant in terms of the geography of the United States. Shut up Mr. Noah. The only thing worse than your face on T.V. is your face on T.V. accompanied by an audio stream of the words coming out of your mouth. Your team has its fair share of "Hollywood" in Derrick Rose. He's the league MVP and plays for possibly the most storied franchise in the history of the NBA. The Bulls were fan favorites in this series as any team will be that plays against the Heat. The Heat are the Hollywood villains and in this series the Bulls were the knights in shining armor. Unfortunately their horses bucked them off their backs and their blades were not true. Time for the Mavs to saddle up and see if they can win the final battle of a war no one else has been successful in. In the end though the Heat beat you, Noah, and the rest of your team because your star player couldn't sink a free throw in crunch time. End of story. While James and Wade did go on an epic run to close out the game the responsibility lies solely on Derrick Rose's shoulders. His ineptitude in the fourth quarter made it all possible. There's always next yearr Rose, get back on that horse. It's time for everyone to stop looking for ways to look down on the Heat and accept that this may be the beginning of what will become a NBA dynasty. I for one am excited to see what they do in the NBA Finals and for years to come. Oh and don't worry Noah, hopefully you can keep yourself out of the news in the offseason and I can cut you some slack. Maybe next season we can have a better relationship.